Cyber War versus Cyber Realities: Cyber Conflict in the International System. Cyber operations, cyber crime, and other forms of cyber activities directed by one state against another are now considered part of the normal relations range of combat and conflict, and the rising fear of cyber conflict has brought about a reorientation of military affairs. What is the reality of this threat? Is it actual or inflated, fear or fact-based? 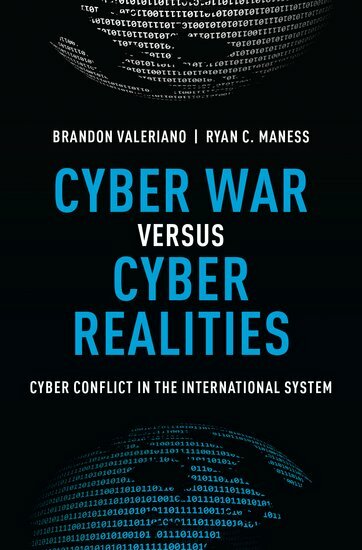 Valeriano and Maness argue that there is very little evidence that cyber war is, or is likely to become, a serious threat. Their claim is empirically grounded, involving a careful analysis of cyber incidents and disputes experienced by international states since 2001, and an examination of the processes leading to cyber conflict. "This is an important book which deals with very difficult questions. The authors bring a fresh approach in their diligent focus on the available evidence and how that evidence can be fitted to what we know about how the international system works. While this brief review cannot begin to do justice to the book's content (my copy is festooned with sticky notes and looks like someone spilled a bottle of yellow ink on the interior)"
Cyber Strategy: The Evolving Character of Power and Coercion. Some pundits claim cyber weaponry is the most important military innovation in decades, a transformative new technology that promises a paralyzing first-strike advantage difficult for opponents to deter. Yet, what is cyber strategy? How do actors use cyber capabilities to achieve a position of advantage against rival states? This book examines the emerging art of cyber strategy and its integration as part of a larger approach to coercion by states in the international system between 2000 and 2014. To this end, the book establishes a theoretical framework in the coercion literature for evaluating the efficacy of cyber operations. Cyber coercion represents the use of manipulation, denial, and punishment strategies in the digital frontier to achieve some strategic end. As a contemporary form of covert action and political warfare, cyber operations rarely produce concessions and tend to achieve only limited, signaling objectives. When cyber operations do produce concessions between rival states, they tend to be part of a larger integrated coercive strategy that combines network intrusions with other traditional forms of statecraft such as military threats, economic sanctions, and diplomacy. The books finds that cyber operations rarely produce concessions in isolation. They are additive instruments that complement traditional statecraft and coercive diplomacy. The book combines an analysis of cyber exchanges between rival states and broader event data on political, military, and economic interactions with case studies on the leading cyber powers: Russia, China, and the United States. The authors investigate cyber strategies in their integrated and isolated contexts, demonstrating that they are useful for maximizing informational asymmetries and disruptions, and thus are important, but limited coercive tools. This empirical foundation allows the authors to explore how leading actors employ cyber strategy and the implications for international relations in the 21st century. While most military plans involving cyber attributes remain highly classified, the authors piece together strategies based on observations of attacks over time and through the policy discussion in unclassified space. The result will be the first broad evaluation of the efficacy of various strategic options in a digital world.